Crossover Piquant: Check this out! One of the great promises of technology is to make things simpler, easier, and more affordable for end users. In the medical practice, we have so much complexity, difficulty, and cost in most of our processes that when we find something that actually works as advertised we fall in love. I had one such “appealingly provocative” experience this weekend. While attending a high school football game in support of one of my member patients (leading passer in Orange County by the way! ), the player was injured. I initially thought it was a concussive injury but the reason he remained down was the he knew he had severely rolled his ankle. His father called me from the field (I was in the stands) and I followed along by text messaging as he was treated initially by the trainer and later by the team orthopedic surgeon. He was unable to continue playing due to the injury and it was iced and wrapped overnight. The next morning I met him at our clinic, fired up our new TRX GP-5 machine (all digital x-ray machine), and took some beautiful images. These were captured on our PC based OmniView rendering software (proprietary and expensive) and fed to our OsiriX viewing software (open source and free!). I was able to manipulate the image at will, contrast and enlarge as needed to highlight all the structures, and automatically send the image to a remote radiologist for reading. No films to carry, no chemicals to purchase, and no storage required – ever. Simple, Efficient, and Affordable. But I was just warming up. The piquant was my ability to wirelessly transmit the image from my MacBook (serving as a server) to the iPad. This process is made possible by the fact that I have can move the standards based DICOM image from a PC to a MAC (using OsiriX), and then push it out to my iPad. While I thoroughly enjoy technology, I often get frustrated because I lack the technical expertise and patients to work out all the kinks. I was pleased to see that I was able to point and direct all the connections where they needed to go and the images appeared neatly onto my iPad without any problems. 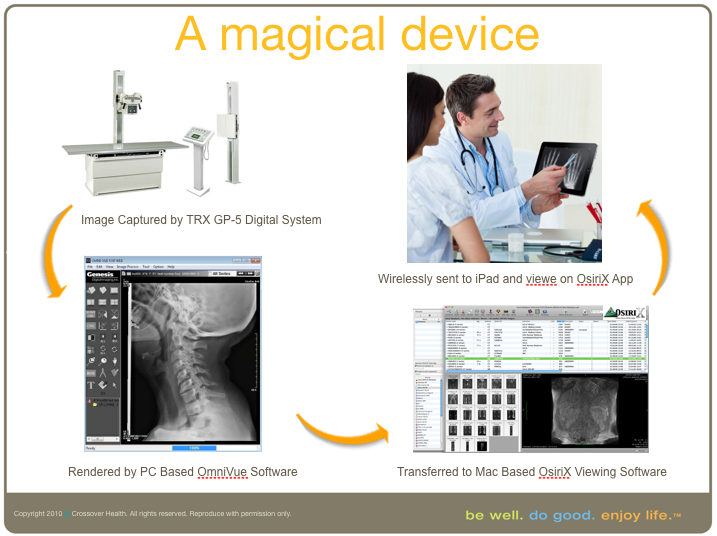 From the patient experience, all they knew was that the image was shot, its being read by a board certified radiologist, and they are seeing, touching, and experience the iPad as a new device in our patient-physician relationship. The patient was intrigued, impressed, and engaged (entertained?) by the whole process. I dare say it was a “fun” visit (why does the typical health care experience have to be so lame anyway?) for them to participate in this process, see their physician pushing the technology barriers, and engaging in the diagnostic process in a way they never have before. The piquant experience certainly piqued the interest of their family who had the family. This entry was posted in Design, Health 2.0, Innovation, Open Source, Uncategorized, Value.